When the temperature rises and school is out, young people in neighborhoods with few resources and activities to keep them busy are at a higher risk of getting into trouble, statistics show. It’s a fact that city officials and law enforcement are well aware of, and the reason behind a program that keeps many city of Los Angeles parks and recreation centers open after dark during the summer. 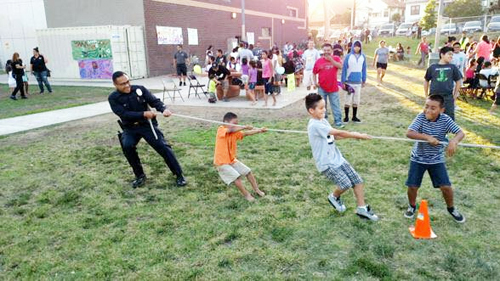 Now in its eighth year, the Summer Night Lights (SNL) program offers free sports, art and crafts and other activities along with meals to youth and their families in many of the city’s most densely populated neighborhoods. Highland Park resident Teresa Martinez has been taking her children to the Highland Park Recreation Center for the last two years for some summer fun. “There are a lot of activities going on and the Summer Night Lights program is very popular in this area,” she told EGP Monday. “They offer free food, drinks, music, raffles, a lot of stuff,” she said. This year, Martinez’s 10-year old daughter will play on a softball team while her 13-year old son hopes to join a basketball team. When young people are busy doing things they enjoy, they are less likely to get into trouble or be recruited into gangs, according to then councilman, and now Mayor Eric Garcetti when he spearheaded the program eight years ago as a way to combat gang activity in Glassell Park and surrounding neighborhoods. 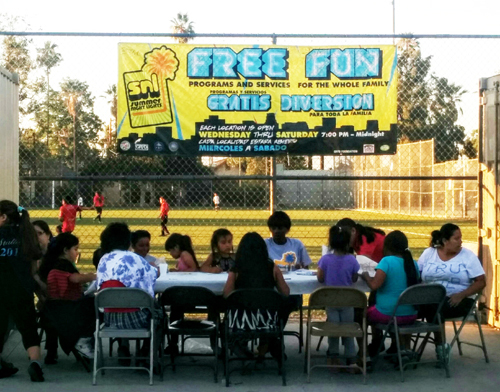 In partnership with the Office of Gang Reduction and Youth Development (GRYD) and the City of Los Angeles, the “park after dark” program has since expanded to 32 locations across the city. SNL has proven to be a good tool for reducing violent crime while promoting peace, positive activities, and healthy outcomes for residents, according to the GRYD. Summer Night Lights focuses on areas most impacted by gang violence, unemployment, and with high concentrations of youth and young adults. “This is a great opportunity to participate with the youth and create a positive point” of contact, LAPD Northeast Division Sgt. Christopher Gomez told EGP. He said his Special Problem Unit oversees the Glassell Park and Highland Park locations, helping families feel more comfortable about their young people taking part in night time activities. Martinez said she was at first reluctant to take her children to the park where some sports programs can run until 11 p.m. Those fears have since been allayed: “There is always a lot of police activity and there’s a lot of parent involvement too,” she explained about why she’s now glad Summer Night Lights is offered in Highland Park. According to GRYD, in 2014 over 900,000 visits were reported across all 32 Summer Night Lights sites. There was a 15.4% reduction in gang-related crime— Wednesdays through Saturday between June 25 and Aug. 9 — compared to the same period in 2013. Over half a million meals were served during the hours of the program. According to officials, more than 10,000 youth have participated in soccer, basketball and baseball sports leagues and in sports clinics with the LA Kings, LA Galaxy, LA D-fenders, Play Rubgy USA, CHIVAS USA, and WNBA/Coca Cola. — Arts: nightly art workshops, culinary arts, silk-screening, mural painting, zumba, hip-hop dance and poetry. — Department of Public Health Resources. The program will also hire some youth, ages 17-24, to work at site locations. In 2014, 1,068 local jobs were created and 325 at-risk youth were hired and provided on-going training. Added this year is a pre-program assessment focused on identifying educational careers and goals for youth involved in the Summer Night Light program.